A touring bicycle is a bicycle designed specifically for bicycle touring (also referred to as “cycle touring, bike touring, bike travel, bicycle travel, adventure cycling and bike-packing”) – the act of riding a bicycle for days, weeks, months, or even years on end as you travel across entire cities, states, and countries under your own power (without the assistance of a motor). There are hundreds of different touring bicycles available to you. There are touring bicycles made for short day rides near your home; touring bicycles for fast, speedy and lightweight club-style cycling adventures; and touring bicycles made to carry you and your gear all the way around the world. No two touring bicycles are the same! This article contains a list of 100 of the world’s most popular touring bicycles, along with a photo and a short product description of that bike (usually from the manufacturer). But be warned – each of these touring bicycles has been designed for a specific purpose. While the bikes on this page may look similar to the untrained eye, there are a number of minute details that make each bicycle better equipped for a certain type of bicycle touring. For example: Did you know that there are three main types of bicycle tours with more than a dozen different sub-types under that? For each of those various types of bicycle tours, there is a corresponding type of touring bicycles. This means that a bicycle designed for short local day trips should probably not be used for a long-distance bicycle tour across an entire country or all the way around the world. And a bicycle made for off-road riding won’t last long if used alongside bicycles designed with fast, speedy sport touring in mind. This is why it’s so important that you understand not only the different types of bicycle tours, but also the different types of touring bicycles and what they have been designed for, before you go out and purchase a touring bicycle for yourself. More details on this can be found inside The Essential Guide To Touring Bicycles. Sadly, most local bike shop owners don’t know much (or anything) about bicycle touring. Because bicycle touring is such a small niche within the cycling industry, local bike shops rarely ever focus any of their time, energy, or money on this type of cycling and almost never have touring bicycles of any kind on hand at their stories. If you can find a local bike shop with someone working there that actually knows something about bicycle touring, you should consider yourself very lucky! Unfortunately, many of the people who go into a local bike shop looking for a touring bicycle come out having been sold a bicycle that isn’t really designed for bicycle touring at all. The result of this is not only an investment in a product that won’t suit your needs, but could result in damage to your bicycle, your belongings and your body (because an ill-fitting or improperly designed bicycle could break apart during a bicycle tour (yes, this really happens… and it occurs more often than you might thing) or cause pain, discomfort and even long-lasting nerve damage to your body when used on a multi-day bicycle tour). So, go ahead and check out the impressive list of touring bicycles below, but before you go out and purchase a bike for yourself, make sure you understand what type of touring bike you are buying and how you wish to use it. Don’t make the mistake of buying the first bicycle your local bike shop owner suggests. The bicycle you buy is going to be the biggest and most important investment you make… so make sure you make the right decision! The Bianchi Volpe features a smooth riding steel frame and fork and a variety of good components from top manufactures so as to deliver a great affordable bike that can do anything from commuting to hard road rides. Pacific Coast Highway 101, Lake Garda en-route to Lake Como, the Cabot Trail or the Tour D’Afrique. Just climb aboard and pedal where your heart leads you. With classic features which are imperative in Brodie’s first ever touring bicycle, you’ll be so happy that your first touring bike could easily be your last! Shimano STi levers handle the shifting and braking duties, a triple chain ring lets you choose the rate of gait and a cromoly frame keeps the components flying in tight formation. Beautiful looks without the beastly price. Designed for serious loaded touring, with a frame geometry that ensures a stable ride. Versatile 26″ geometry will accept standard road tires, as well as the normal 26″ off-road capable tires. Back in 1983, Cannondale made its very first frame: a touring bike. Since then, the touring bike has always been in its line. From the market in Kara-chi to the grocery in Kalispell, Cannondale touring bikes have been there, done that. The Co-Motion Americano has established the standard for what a touring bike should be – an entirely new breed of bicycle that handles self-supported, transcontinental touring without even breaking a sweat. We’ve developed ideas from our unsurpassed tandem designs to increase touring load capacity and provide a level of rugged reliability unmatched by any other bicycle. If you’re not seeking the extreme capabilities of Co-Motion‘s Americano or Pangea bicycles, the Nor’Wester Tour is one of the finest touring bikes money can buy. The Nor’Wester Tour provides an incredibly stable ride and the kind of positioning you want when your goal is to cover more ground while taking in the scenery. An outstandingly rugged, 26” wheeled touring bicycle that is perfect for our shrinking world. The Pangea has all the features you need for touring in the most challenging of environments. Far from a mountain bike with a drop bar, the Pangea is designed with the stable, responsive touring geometry that has made Co-Motion an industry leader. The Cube Central has been designed deliberately more sporty than the other models in Cube‘s Global Travel Series. The Central combines the technology of Cube‘s Global Travel Series, but with more athleticism. The ambitious design of the Delhi makes for a perfect trekking bike. The bike has a long wheelbase, so you can ride in comfort—even with a large load. Cube‘s Global Travel Series bicycles are distinguished by their high comfort and easy handling. Special emphasis is placed on the frame geometry, weight and maximum stiffness. This bike has extremely balanced handling and is capable of carrying heavy loads. Long rides and short tours are what the Cube tour bikes were developed for. Adventures on two wheels, no matter if the weather is good or not. The especially developed ECG – Efficient Comfort Geometry delivers a comfortable riding position without sacrificing optimum power transfer. The all day, all weather, all roads, travel bike. The Tournado is a handmade, lugged steel touring bike that celebrates classical frame geometries and component designs. In true hand-made tradition, each frame is painstakingly welded and brazed from Tange Prestige tubes. The Tournado features a frame geometry designed for upright riding stability. The result is a superbly balanced, supple ride that will deliver mile after mile of smiles and still packs easily into a suitcase for your next adventure. The Dawes Galaxy features another legendary tube set made from Reynolds 631. The forks use Reynolds 520 chromoly blades that make for a smooth but reliably strong ride for the longest journeys. Equipped with 27 speed Shimano Deore gears with bar end shifters, Trktro Oryx cantilever brakes, Tubus cargo carrier, WTB Dual Duty rims, Shimano hubs and Schwalbe tires. The Galaxy is a great touring bike. The Horizon features a reliably strong, yet light, Reynolds 520 chromoly frame and chromoly forks. The geometry is configured to give enhanced comfort even through those long days in the saddle. It is equipped with 24 speed Shimano Alivio gears, Tektro Oryx cantilever brakes, WTB Dual Duty double wall alloy rims, Shimano hubs and Schwalbe tires. Those long journeys are made more comfortable with the Selle Italia FLX saddle and chromo-plastic mudguards. The KaraKum features a lightweight alloy frame and chromoly fork. Distinctive because of its butterfly handlebars it offers unrivaled comfort with multiple riding positions on those long tours. A roll call of quality components consist of Shimano Deore 27 speed gears, Shimano hubs, Shimano V-brakes, Scwalbe Silento II tyres and an ultra comfy Selle Italia FLX Gel saddle. Bikes really don‘t come much tougher than the Sardar bike, with its strong 26″ double wall rims, steel trekking fork and it‘s compact alloy expedition frame. The Sardar really does allow you to attack almost any terrain you choose whilst still allowing you to carry every necessity you desire. The Vantage is designed for the tourer on a budget who still wants the best value money can buy. With a 6061 alloy frame and Chromoly fork you’ll experience a quality ride and still be able to carry your kit on board. The Vantage is ready for anything with its Shimano 24 speed gears, Truvativ cranks, Schwalbe tyres, luggage rack and mudguards. An ideal starter bike for long jaunts. Sturdy frame. Triple curved seat stays that help reduce vibrations. The fork can be used to install both a rack and front disc brake. With its proven design, the Caribou is the great travelers‘ bicycle. The Caribou is designed and assembled in Canada. The Fuji Touring is a full-fledged touring bicycle with a classic look and modern components – available at a super low price. An excellent introductory touring bicycle! Whether you ride for fitness or transportation, Giant‘s CRX-1 will get you where you are going. The Lightweight ALUXX frameset and wide-range gearing tame steep city inclines, while the quick handling reflexes and flat bar let you sling corners with precision. Tuned ride comfort meets road racer efficiency. GT’s renowned Peace platform, built for touring. If your idea of a perfect ride is cruising the countryside, panniers packed, and rack loaded down, this is your ride. The Jamis Aurora is arguably the last of the production-built, loaded touring bikes—unbeatably efficient at hauling you and your stuff, and the ultimate ride for big-distance commuters and cyclo-tourists. The bike‘s touring geometry combines a lanky wheelbase with stability-enhancing weight distribution. Introduced in 2009, the KHS TR-101 has quickly become a big hit with the touring and trekking crowd because of its low price and touring features, such as front and rear fenders and braze-ons designed to support both front and rear racks. The Koga-Miyata Traveller is a popular touring bike with an aluminum frame. It is a complete, appealing bicycle for versatile use. The bicycle comes in both a mens and womens version and can be purchased in both aluminum and steel. The 26″ touring bike for rough terrain; also ideal for mountainous or pathless terrain. The super stable aluminum frame is completely outfitted with Shimano Deore XT equipment, Tubus carriers, double eyeletted rims and battery lighting. Feel good all over the world and then some with Kona’s wondrously refined touring bike. This year the Sutra returns with new chainstay mounted disc brakes for easier fender fit and more fender options. We’ve also added lighter, disc specific stays and, ahem, fenders themselves (sorry for the delay). Take your pleasure seeking on the road, ride deep into new dimensions, and do it all on a bike specifically designed to take you there-and back again of course. The line of Trans trekking bikes from Kross were designed with the thought of long trips on paved roads in mind. Thanks to the geometry of the frame, a comfortable saddle, fenders and rear rack, the bike is perfect even in difficult conditions, whether you choose to travel near your home on go on a much longer expedition. The Trans Pacific was designed with the thought of long trips on paved roads in mind. Thanks to a comfortable frame geometry, fenders and rear rack, the bike is perfect if you choose to go on a real expedition far from home. Designed with disc brakes, front and rear fenders, braze-ons built for front and rear racks and all the comfort you would expect in a fully-loaded touring bicycle, you‘ll be lucky if you can find this bicycle on the market today. It’s no longer in production as far as we know. The roads around the world are at your fingertips with Turismo! Robust and stable, its framework has been designed to support heavy loads while maximizing energy transfer, thus ensuring the rider reaches port as efficiently as possible! The Norco Cabot is a touring bike built with a Reynolds 525 chromoly frame, 3 water bottle mounts, pump pegs, spoke holder, fender/rack mounts and IS disc tabs. Full Shimano 18-speed drive train with 105 rear derailleur. Sturdy wheels: Shimano LX trekking hubs, butted stainless spokes and Mavic A316 hole rims. The Norco Fraser is a touring bicycle built on a double butted chromoly frame with 3 water bottle mounts and fender/rack mounts. Shimano 18-speed drive train with FSA Vero triple cranks. A bicycle that may no longer be in production, the Norco Qwest is a bicycle designed with sport touring and trekking in mind. The butted Chromoly frame easily accepts both front and rear fenders and racks. The Novara Randonee is a traditional touring bike sold by REI. It’s apopular, low cost touring bike model that’s great for beginners looking for their first touring bike. The ultimate adventure-touring cycle, the Novara Safari rides on – even when the pavement runs out! A popular touring bicycle sold at REI stores in the United States. Weighing in at 27.6 lbs, the Opus Largo is a traditional touring bike built on a triple butted profiled CrMo frame with an Ora Touring aluminum raked fork. Front and rear rack compatible. Weighing in at 25.8 lbs, the Opus Legato is a lightweight touring bike built on a triple butted profiled 6061 aluminum frame with an Ora Touring aluminum raked fork. Front and rear rack compatible. The lightweight Argos is a fast and agile bike, but not only on smooth asphalt: it rolls on easy running 26″ tires and provides good grip even on trails. With a noble frame made of Columbus Zona tubing, the Argos has a geometry and seating position that allows you to go from long distance to sporty. The Boston combines the driving characteristics of a modern light trekking bike with the sporty elegance of the classic sports bike. Thanks to its high-quality components and the long-distance posture it is suitable for long-distance cycling and for everyday use alike. The Helios is a light and elegant sports bike. The framework architecture is of the highest quality. Even with all of its components, the weight is surprisingly low. The Helios shown here weighs under 13 kg (with lights, without pedals). The frame is stiff, but with just the right degree of long-distance comfort. The Randonneur drives like a racing machine – both in the narrow 28″ version and with the wider tires on the 26″ version. Two or three different race configurations can be chosen from. The Ranger was named “Bicycle of the Year” in 1985, even before the term “trekking bike” was coined. In the meantime, over more than 20 years of continuous product development, the Ranger has evolved into an impeccably well-engineered trekking bike of premium quality parts. The frame of the Sport Tourer is a pure racing frame. For light day trips, a rear rack can be mounted onto the rear. The Terra is designed as a 26″ touring bike with wide tires for those planning to travel with gear on rough roads. Its durable Chromoly frame is lugged and carefully soldered by hand, like all bikes from Patria. Absolute quality and stable driving is what you will find in the sporty bicycle. It is easy to maneuver, safe and comfortable, even under high loads and at high speeds. It is suitable for sporty drivers, but is great for cyclists traveling long distances with luggage as well. A modern touring bike with old-school charm, the Raleigh Sojourn features Reynold 520 Butted Chromo w/CNC Dropouts, Spoke Holders, Pump Peg, 4130 Chromo Cross w/Disc Mounts, Shimano Tiagra & Shimano Deore deraiulluers, Shimano FC-R453 Octalink 30/39/50t Cranks, Shimano Dura- Ace 9spd Bar End Shifters and Freedom Ryder 2.3 Trekking Double Wall Rims. If you are looking for a sensible steel touring bike, the Panorama might just be the bike you‘ve been looking for. The Ridgeback Panorama features Reynolds tubing, top of the line Shimano components and the kind of ride that long distance expedition types really enjoy. If you want comfort, then the Ridgeback Voyage is the bike that will provide all you need and more. It is responsive and fantastic to ride around the city or on the open roads. The touring is optimized for low weight without compromising functionality. The 27-speed derailleur is sporty and very efficient. Other features include a high quality lighting system with steady light function and LED technology. Demanding everyday cyclists can find their own personal training partner in the Delite touring. The traveller’s special, super-rigid frame ensures a very stable ride. The 27-speed derailleur (Shimano Deore XT) and disc brakes are reliable and time-tested. The special expedition rack is connected via a linkage system to the rear swing-arm providing greater rigidity. There is no tour that it can’t handle. The Intercontinental is a pro tourer designed and developed to withstand even the hardest of applications. If you intend to go on a world tour by bike, you’ll already be a step ahead with this premium, robust touring bike. The extremely tough frame has many interesting design details: a rigid rear rack integrated into the frame, and connected to the rear suspension system by a link system, over-sized tubing and long wheelbase geometry. The Clubman combines the best of tradition with modern technology. It’s a design aimed at the rider who rides regularly on the weekend and enjoys the odd cycling holiday. The Clubman is tough enough for long-distance tours, yet comfortable enough for regular commuting. The Cumbria is the perfect combination of commuter bike and heavy-duty tourer. It’s built like a conventionally-styled touring bike, but uses 26″ wheels and has plenty of clearance for up to 26? x 1.75″ tires. While it looks like a mountain bike with skinny tires and dropped handlebars, the Roughstuff is designed firstly as an on-road/off-road tourer. Compared to a mountain bike, it has a lower bottom bracket height for greater stability and a taller head tube/handlebar height for increased riding comfort. Developed and refined over many years using feedback from serious cycle tourists who have traveled the far corners of the world, the Transcontinental is the classic “everything-but-the-kitchen-sink” tourer. A surprisingly light- weight mix of Columbus Nivacrom and Reynolds tubes are joined using the finest lugs and meticulous care to provide for a long lifetime of hard riding. Touring is all about exploring and adventure and there’s no better bike to tour on than the Sherpa. From intelligent rack mounts, to gearing, to durable paint – every detail has been considered. A long-time staple in the Rocky Mountain lineup, Sherpa offers the durability and features that every long distance rider needs. Touring is all about exploring and adventure and there’s no better bike to tour on than Sherpa. From intelligent rack mounts, to gearing, to durable paint – every detail has been considered. A long-time staple in the Rocky Mountain lineup, Sherpa offers the durability and features that every long distance rider needs. If you want room for fenders and big wide tires, mounts for rear and front racks, a bomb-proof frame and fork, mounts for 3 water bottles and a frame made in the U.S.A., what you are looking for might just be a Rodriguez Adventure. This is a comfortable, American made, steel, classic touring bike with modern day components and the old school conveniences, plus hand built wheels with a 3-year warranty. The Rodriguez Navigator is a Randonneur/Sport bike with clearance for fenders, a rear rack and wide tires. The Navigator is a comfortable, versatile bike that is perfect for commuting, day touring, or a weekend ride with your buddies. The Rodriguez Rainier is perfect for the Randonneur cyclist or the commuter who doesn’t need a front rack set up. Not really a touring bike, but a sport bike that accommodates full fenders and a rear rack. Salsa‘s Casseroll Double is a relaxed road bike, perfect for everything from non-competitive road riding and commuting to credit card touring and charity rides. An extremely versatile frame set is what makes the Casseroll Double so… well, versatile. Crafted of Salsa Classico CroMoly, the Fargo is a bit of a cycling anomaly: a disc brake only, drop bar mountain bike designed for off-road tour- ing. Six (count ?em, six) water bottle cage mounts (on sizes 18 – 24″) help keep you hydrated on a long journey. The sloped top tube allows plenty of stand over clearance for those fully-loaded starts and stops. The Salsa Vaya is a road adventure bike designed to take on any surface that someone might consider abroad‘. Crafted of Salsa Classico Cro-Moly, the Vaya is loaded with braze-on‘s for fenders, racks, and lowriders. This makes everything from wet weather commutes to full-on touring a breeze. Hailing from the Netherlands – where they know a thing or two about riding practical bikes long distances – the Santos Travel Master is a very impressive, well-rounded tourer. An inexpensive touring bike made for weekend travel. The Café Racer pays homage to the vintage motorcycles that once roamed Europe‘s motorways of the 1960‘s. Seven‘s exclusive IntegrityTM titanium tubing provides the utmost utility and durability. The Expat is two bikes in one: a mountain bike for loaded pannier exploring and a touring bike that is off-road worthy. 700c wheels allow for every type of tire available—from 23c road slicks to full-on 29er mountain tires. Designed for multi-day exploration of uncharted territory, the Expat excels where the road ends. Long days and heavy loads make touring some of the most demanding riding there is. Seven’s touring-specific tubing design, along with custom geometry and options ensures comfort, handling stability, lightweight, and durability no matter where you go. A genuine touring bike, custom built with your choice of rack and fender mounts, extra water bottle mounts, and more. The Vacanza employs Seven‘s exclusive ArgenTM butted titanium tubing. Point the Tricross down anything from a gravel strewn fire road to a pothole packed bike path or maybe even a chunk of smooth single-track, and you’ll realize that its numbness-killing chassis, predictable geometry and robust wheelset will help you redefine what’s possible on two (skinny) tires. The frame itself is Surly’s own 4130 cromoly steel, and provides a relatively relaxed and forgiving ride. Like all of Surly‘s bikes, the parts package was chosen for its value, durability and purpose. Surly sells it as a 2×9 speed, but you could add a third ring if you wanted. Or you could make it a single speed. Or a fixie. People use it for commuting, light touring, single-track riding, hauling kids, just about anything you can do on a bike. If you want to carry a lot of stuff while riding your bike long distances, you‘d be hard pressed to find a better bike than the Long Haul Trucker. It starts with the frame, whose custom drawn 4130 tubing and geometry were specifically designed for loaded travel, low bottom bracket for stability, long head tube, long stays, the whole thing. Surly added braze-ons for everything you‘re likely to need. They gave it parts that are durable and long lasting, and ready to travel. Add racks, bags, and fenders… and go somewhere! The Valkyrie Tour is a sporty bicycle designed specifically for women that has clearance for fenders as well as has rear rack mounts, alpine gearing and all the comfort of steel for long, loaded days on the road. A superb frame, fast enough for high performance cycling. Comfortable enough for long distance Audax events. Strong enough for medium weight touring. Inexpensive enough for winter training. A modern take on a traditional touring cycle at a good old fashioned price! With geometry that truly gives impressive handling! Ideal for leisure, medium paced Audax, commuting, touring and cycle camping. 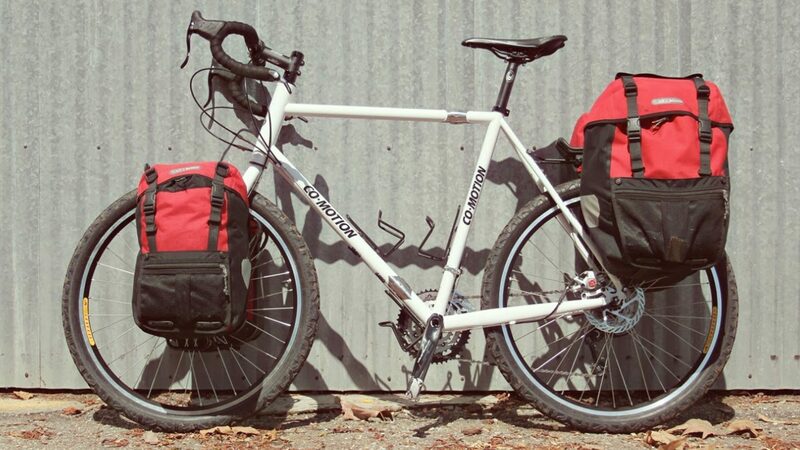 The ultimate, yet affordable, Rohloff equipped expedition touring bike. With an option to add S&S couplers, the Raven Nomad is totally reliable, easy to maintain, and cheap to run. Lifetime frame guarantee. The Thorn Raven Sport Tour is a high performance road-going machine with a sporty geometry, low bottom bracket height and tight clearances. It‘s a lightweight bike with traditional touring capabilities. A high performance touring mountain bike, designed specifically for the Rohloff hub with the EX box. Utterly stunning off-road performance! The Thorn Sherpa can take you to the other side of town, or to the other side of the planet. It is rugged enough to survive careless handling, yet light enough to be enjoyable in your sportier moods. The Sherpa is unlikely to be your fastest bike, but over time it may grow to become your favorite bike. It is so versatile and reliable. Good looking, but not ostentatious. You can take it anywhere. The 5th Avenue is a bicycle for the particularly discerning everyday cyclist. It runs exceptionally smoothly on a level thanks to its slim-line 28 inch wheels, and it effortlessly ascends slopes with its (in everyday cycling terms) sensationally low weight of just 12.5 kg. The Boulevard is a lightweight urban bike perfectly suited for pleasurable and classy cycling. Design and sophisticated technology are at the very forefront: balanced ergonomics, easy handling, and preeminent comfort. The Grande Route is a classic Randonneur who enables long distance riders to cover great distances in a sporty pace without abstaining from a comfortable seating position. With the Panamericana you are equipped ideally for all adversities you potentially experience on remote routes. Gravel roads and twisting single-track will hardly affect you, because the Panamericana is the first full suspension travel bike that is exclusively designed for this purpose. The Silkroad is an extremely robust travel bike. The “less is more” principle was the main focus when designing this bike. By integrating the rack into the main frame of the bike, many of the weak points you find on typical touring bikes have been cut out. The Via Veneto is characterized by its fast and agile handling and is especially designed for sporty cyclists who are looking for an urban bike as well as one that can be used for light touring. Outfitted with features like an extremely durable butted chromoly frame, wide-range Shimano gearing, and stout Bontrager rims, the 520 strikes the perfect balance between the amenities you’ll want for comfort and convenience and the reliability and performance you’ll need for long-haul peace- of-mind. A technically advanced, high-quality trekking bike made in Poland. Unibike‘s best-equipped touring bike. Complete Shimano LX indestructible, Schwalbe Marathon XR tires and an oil shock are just a few advantages of this super tough bike. The geometry of the Amazon has been designed to enhance day-long comfort and stability under load, whilst still offering rewarding handling for a faster ride. The Van Nicholas Amazon is a Cycle-Cross/touring/upright road and Audax frame. You can seize the day and configure this frame in a multitude of variations to meet your performance and riding criteria. This bicycle comes in a ladies, Rohloff and Rohloff ladies version. This bike was designed so that as little as possible could go wrong with it: so no hydraulic cables, no derailleurs and no front suspension. Van Nicholas combined a heavy-duty, paint-free Titanium frame with a Titanium seat post and bullet-proof Schwalbe Balloon Tires for comfort. And it comes with the integrated 14-gear Rohloff system (like having 27-MTB gears) for one- handed shifting through the entire range, whilst stationary or pedaling. This bike‘s Taiwanese welded frame is a contemporary interpretation of a classical touring bike with a heavy-duty steel frame. With rack mounts on the front and back, you can use this bike for your touring needs or use it to quickly get around on the open roads and asphalt strips. Developed by the team involved in the original ‘Randonneur Project’ that started in the early 1980’s. The frame is made from double-butted Cr-Mo steel to give a more ‘alive’ feeling that is a delight to experience, especially on a long day. If you are looking for the ideal touring bicycle, the T-400 models from VSF Fahhradmanufaktur may be your answer. These bicycles have been designed to be extremely compact and robust. The frame geometry ensures high stability and good handling, and the Magura hydraulic rim brakes are there for safe braking in any situation. The epitome of timeless aesthetics and quality: The T-700 scores with its sporty handling, and offers high stability and ease. A good performance, durable, and fast bicycle. VSF Fahhradmanufaktur produces a number of commuter-style trekking bicycles in their line of T-50, T-100 and T-300 bicycles. The T-models from VSF Fahhradmanufaktur give you easy-to-control handling, equipment that meets all the requirements of your specific ride, and of course—elegance and comfort. An inexpensive, Eco-friendly sport utility vehicle. Custom Chromoly tubing and Touring-Specific geometry. So comfortable, it lets you hit the road without it hitting back. While the bicycles listed on this page are indeed designed for the various modes of bicycle travel, I chose (simply as a matter of aesthetics) not to include any folding bicycles, recumbents, tricycles or cargo bikes in this list of touring bicycles. This is only 100 of the more than 150+ different types of touring bicycles you can choose from. 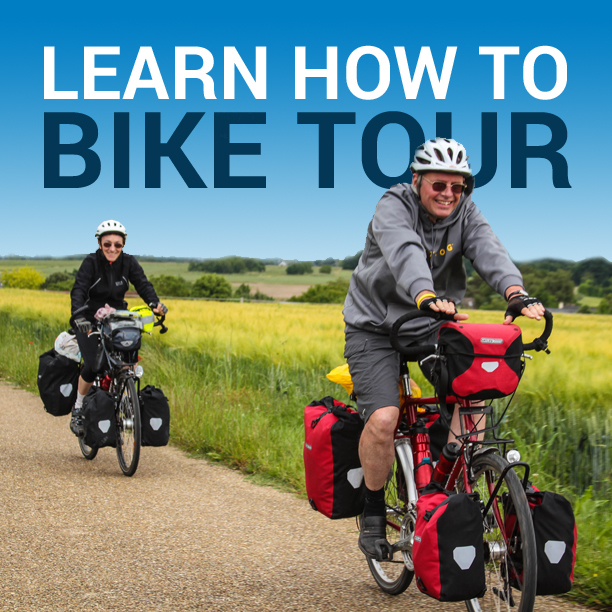 Inside The Essential Guide To Touring Bicycles there are even more touring bikes listed for you, along with detailed information about what makes a touring bicycle different from other bicycles you are probably familiar with (such as road and mountain bikes). The Essential Guide To Touring Bicycles discusses the important features that makes touring bicycles ideal for long, multi-day cycling adventures and how the manufacturers of these bikes tweak their designs ever-so slightly in order to make the bicycle more rugged and able to carry more weight/gear, while at the same time making the bicycle more comfortable on your body (especially on your back, neck, arms and hands). If you have experience with any of these bicycles, I would love to hear what you have to say. Leave a comment below and let me know what bike you have, how you’ve used it and what you like best/worst about that bicycle. This entry was posted in Bells, Bicycle Touring Pro Articles, Featured Articles, Main Articles, Planning, Products, Touring Bicycles and tagged 100 touring bikes, best touring bikes, bicycle touring bikes, cycle touring bikes, list of touring bicycles, long distance bikes, the essential guide to touring bicycles, tour bike, touring bicycle, touring bicycle brands, touring bike, touring bike list, touring bike models, touring bikes, touring cycle. 2013 Specialized Tri Cross Sport Disc, decked out for touring. racks, fenders, a triple, brooks saddle, bar riser, trekking bars, front an rear torch. def not a turn-key but more passion goes into it. Thank you for this list! It would be even more helpful, if you included price categories too, it would be even more helpful! Hey Darren, my name is Aiman. I’m brasilian spending the summer in Norway now, and realy feeling to make a small touring bike here. Something like a 5 days trip. The thing is that I’ve found one Merida Hybryd inside a container garbage here in Oslo and I’m trying to fix it to travel a bit. Since you like Norway and Sweden, and acctualy at this moment you are traveling in this area, I wanna ask you if you think that a simple Hybrid Merida would be enought to make this 5 days trip…cicling some moments on the asphalt and some moments in the forest (but more in clear paths and tracks). What do you think? Hope you are enjoyng your trip, Scandinavia is realy amazing, for sure! Thanks anyway, Aiman. Yes, I think a Hybrid bike like that will probably work fine for a short 5-day bike tour. Just as long as it is in good working condition. I have an original Bianchi Volpe, circa 1991. Tange superset and suntour xpress/x1 drivetrain. Winters, loaded touring, tooling around. I think that frame will outlive me. Glad to see they still build them, but I wouldn’t trade on the new model.. Thanks for the good and comprehensive list. Please try to look at the following as well. I had a Miyata 610 for a few years and did many three day trips on on it, and it would have been the same Miyata 610 the same bike I would ride from Vancouver to Montreal in 1986, however Air Canada destroyed my original Miyata. I stripped some of the non-standard stuff like my 40 spoke concave Weinmann back wheel and put it on my replacement Miyata 610. That 59 day ride from Vancouver was a trip of a life time. But definitely would still like to one day complete the stint to the East Coast. Darren, you have included the Salsa Fargo but have omitted the comparable Surly Troll. As you know, I rode 6200 miles around the US on varying terrain and experienced few mechanical issues. I would recommend this bike to anyone who isn’t a weight weenie. Dutch high-end Koga-Miyata has been re-named KOGA. No connections with Japan anymore. Dutch-German IDWORX is non-plus-ultra. Wow! Check it out and put it on this list, please. All German STEVENS is a favourite among Germans. Top quality. Didn’t see the Surly ECR on the list. It is a workhorse for bike packing and off road touring. Don’t let the big 29+ Knard tires fool you though, it does well on sealed roads even though it lives for dirt and gravel. Photo for the Cube Delhi appears to be a Giant CRX1. Lot of really nice bikes. Hello all, here is my review of the Surly LONG Haul Trucker. I have the Bike since November 2010 and am very pleased with it. It is a very solid comfortable Platform for carrying loads of Gear. It gives a very comfortable ride over long distances. I got the complete Bike with the Standard Components plus SKS Mudguard . I just did not like that WTB Saddle that came with the Bike to sharp so I got a Brooks Leather Brown B17 Flyer Saddle with Springs which is very comfortable. It is not a terribly fast Bike but fast enough , but dont expect it to chase after other Cyclists on group Rides. Now for the niggles , It could do with a Chain Guard around the front Chain Ring. I gouged my Ankle twice with the Teeth of the front Chain ring. So when you are getting your Bike , try and get a Chain guard put on the front Chain ring. Surly recommends you do not put a kick stand on your Chain stay. But it is hard to put a double kick stand on the Bottom Bracket. I have now got a Hebie kick stand that I want to put on the Bike. I just do not like those Cantilever Brakes. They are fine for pottering around the City but not for going down steep hills in the Mountains with a full load . I like the idea of having Disc Brakes that are on the new LHTs more braking power. I have read reports of the repairability of Disc Brakes out in wilderness areas and it seems to be fine. So I am cautiousely optimistic of them and would get a bike with Disc brakes for Touring in the future. Is there anything else I would like to rant about. It would be good for all Bicycle manufacturers to present there Bikes for sale with the options of having Mudguards and Pedals and Dynamo Lights already in Situ just like the Dutch Bikes. Everybody knows you have to have Pedals Mudguards and Lighting so why dont they have them on a Bike when you buy it and Dynamo Lighting is the best. I love the Surly LHT between it and the Thorn Sherpa there is not much difference. If and when I choose another Touring Bike I think I will go for the Thorn Sherpa or Koga Miyata in Steel. Thank you , this is so great! Darren: Very nice list. Given the increasing number and variety of companies making touring bikes, perhaps the bike shops will eventually start stocking a few. The shop I deal with has a Gunnar touring bike, made by Waterford Bikes in Waterford Wisconsin, so I would ask that you include Waterford/Gunnar bikes on your list. A further Addenda to my above review of the Surly Long Haul Trucker. Some of you asked about price. I am from Dublin in Ireland and I ordered my Bike in October 2010 and was delivered to Shop in November so it took about two to three weeks to get to Ireland. The price for the complete Bike was at that time € 1,200 Euro Tax included . The VAT rate Value added Tax / Tax sur le Value Adjoutee/ in Ireland was 21% then it has now gone up to 23%. So the price now might be a bit dearer than €1,200 Euro. The Price for a Dawes Galaxy in Dublin in 2010 was € 1,500 Euro so the Surly LHT was very good value. The brand name Koga-Miyata is history. It’s Koga since a couple of years. bike traveller with a healthy bank account. What’s the matter with the Waterford? For my TransAm adventure in 2014 I used the specialized tricross disc 2013 sport. The only changes I’ve done was a brooks b17 saddle. I should have change the compact with a triple as being loaded and trying to go over the Appalachians and the Rockies proved to be challenging! Great all rounder and very suitable for long distance touring as the bike is versatile and can be loaded with all the accesories needed for touring or skinned and used for sportives or daily commutes. Check the blog for some inspiration or advise. Happy trails! Long chainstay and long wheel base is most important for me (among other things of course). Which bike would you think would be more suitable for me from the European market? Neat list…while my old tourer (LHT – stolen) is here, I’m fairly disappointed not to see my current touring bike, which I love, the Soma Saga. I got a great deal on it when my insurance money for the LHT came in…and frankly, I like it better. Samtos travelmaster. The people at this company have no eye for detail and built the bicycle really really bad! Unbelieveble that people say they built good bikes. The dont care and it is just a mind game from them. The bicycles are not even build symmetric. The alignmentt of yhe bicycle is not good!! Bottom bracket is not good mounted. If you bought this bike… dessemble completly and put it back together. Met 5 s antos travelers and 3 oofthem would not have bought this bicycle again. It is not the dealer that is the problem it is santos and the peoplwith money (4000 DOLLARS)that don t know what they arebuying but taltalk like it . But that is thetargetgroup for santos, blind people with money who have no brains, for bicycles n! Not the real world travelers they only use (abuse) them for there promotion! Feeling bad for al the people who bought this bike for cycling 8000+km because you been marketed and lied to. Big change problems will sttart. Does internet stories don t tell the hole story. Warning!! Ben, Dutch Santos has among the best touring bikes money can buy. A great many world cyclists from both the Netherlands and other countries are in high praise of their Travelmasters and other high-end models from Santos. I’m Riska from Santos Bikes and I feel very sorry to hear that your Santos experience was not what it used to be. We would like to get in contact, so we can discuss whether we could help you to find a solution. We are always open for feedback and take this very seriously, as we have the ambition to build the best bike as possible for every unique person. You could always contact us directly, as our company is small and approachable. We would appreciate it if you could send us your feedback by email (info@santosbikes.com) or call us on +31 (0)252 426 123. Nice list! I’ve never tried touring so I don’t really know what to expect but my friend does it often and he has the Cube Pro Tourer. I love the description for the Cannondale bike, as I live in Kalispell, and yes I have seen these bikes around! The best-descending bike I have ridden is a Bike Friday (Air) in ’05, though I spend more time on Serotta Ti and Bruce Gordon Rock and Road Tour. Why did the folding bike not make the list,especially as the packability of a bike seems so relevant? No Rivendell’s??? The Atlantis is easily as capable as 75% of this list and I’d venture to say far prettier. Did I miss an explanation why you wouldn’t include a companies’ bikes that are in my opinion more suited to Touring than a number on your list… Evidence the Surely Cross Check??????? What do you mean the Surly Crosscheck isn’t for touring, i did a 9000km tour on it. Not one recumbent bike? Really? That’s because this is a list of TRADITIONAL touring bicycles – not recumbent touring bicycles. You have to see http://www.touringbicyclebook.com for a list of recumbent touring bikes. You’re missing the Specialized Awol. It’s a nice bike, and certainly suitable for touring. In this article you miss the aarios bicycles, they are handcraftet and more ore less like the toutterrain, very good velos! I cycled with the aarios discovery through hole europe and in to weeks i will start my asia trip for 5months, and until now i had not once a problem or something with this bicycle. After 28 years commuting and touring on a Peugeot 103 Carbolite heath demands have necessitated a model which has had to be step-through. Thorn cycles seemed to be one of the few companies to cater for older riders and had I been able to I would have gone to them. Unfortunately I now need some assistance and have had to go for an aluminium bike after a lifetime on steel. After a great deal of consideration I went with the Kalkhoff Agattu touring model. I have had this for three years now and it has certainly proved itself to be an able work-horse, both in its load-bearing capacity and in reliability. My only criticism would be that even the smallest model is just a few inches too high for my short legs. I had to remove the suspension saddle to get it to a level where I could cycle safely. The braking system is still a novelty after the appaling braking on the Peugeot. It is great to have such strong working brakes. The lights that come with the bike are not a great deal of use and I have added a pair of Catseye front lights which allow me to see and be seen on unlit country roads. I would still be nervous of using this on a long-haul trip, mainly because of the aluminium frame, (I’m still a steely at heart), lack of public availability of charging facilities and some nervousness about availability servicing of internal hub gears if this became necessary on the road. As my long-term plans did not include air transport, the extremely heavy weight was not an issue. It is not a bike to be lifted up and down stairs or on and off long haul buses! However, until I am forced to move to a tricycle, I think this bike will carry me wherever I need to go for the forseeable future and would highly recommend it to older cyclists or those with disabilities or hip/knee injuries. It will keep people on the road, enjoying life when they can no longer manage a conventional model. I’d like you to consider adding Cinelli Hobo in the list above, Thanks in advance Darren. This list deserves an update. Koga of the Netherlands is no longer Koga-Miyata (quite a few years already!. German-Dutch Idworx should be included – high-end, so it will cost ‘a few dollars more’. Hamburg-based Stevens is another good manufacturer of quality trekking bikes. My Stevens Sovereign XT Lite not only has a stiff frame, the components are top: Tubus, Pletscher, Ergon, Shimano XT, the best. Stevens bikes are much better than the VSF Fahrradmanufaktur ones, praised by the author of this list, Darren. Frames score good on stability? Forget it! Just go downhill fully packed and you will feel the difference with better bikes. My advice: spend more and you get so much more. By the way, where do people from all over the world (yes indeed) buy a new quality trekking bike? Just visit http://www.vakantiefietser.nl. In Amsterdam, so another good reason to come to the Dutch capital. The best bikes, the best advice. No, I am in no way connected to them. Ask owner Eric about VSF! Another good one to check out in the Four Corner’s Collection from Marin. Two build options. I have the 2017 Marin Four Corners Touring bicycle. Very happy with frame geometry, stock 700x40c tires and disk brakes. For some reason this bike does not get much coverage, maybe cause other brands are just more of a house old name. Please review the gorgeous Mariposa Touring bikes built by Mike Barry in Toronto. These bikes are renowned for their design, quality of build, and performance. Favoured by Randonneurs and world tourists for the last 40 years. When I read your article I couldn’t help wonder where all the recumbents were. You have some nice bikes here but if you really wanted to sample everything there should have been at least 5 or 6 bents in the list. My bike for example. Slipstream by Longbikes. Long wheel base bicycle built like a tank. Capable of 100+ miles a day, day after day. Over sized tube. Good strong racks. Let’s you look at the scenery in stead of the road below you and never a soar muscle at the end of the day. I don’t think any of the bikes listed here can top that. I think you should rewrite the article. Be a little more open minded and get to the truth. I know bents are for every one but if a few people had voted in a different direction a few years ago these you listed here probably wouldn’t exist today. Why? Impractical, painful and unsafe. I have a 2016 Velo Orange Campeur, a medium trail touring bike in the old French style. Its not mentioned in your list, but is absolutely brilliant. Road, gravel, gentle off road; a fantastic machine. I’m running 700C x 38mm Compass tires, full fenders, 3 bottle cages, triple crankset (24/34/48) with an 11-34 cassette – just a lovely bike. I’m 70 so I need the wide range gearing. The only negative: after running discs on my 2006 Giant mtn bike turned commuter/tourer/errand bike, I find the cantis on the Campeur are woefully inadequate in the rain and require too much pressure on the levers when compared to one finger disc baking. Ive been riding a Fuji Tourer for five years, its a really nice bike, but worn out a bit now. My next bike (in a few weeks I hope) will be a Vivente Swabia. This bike come fully kitted out with Rohloff 500/14 hub and Gates Carbon Drive. I’m very excited about it. The man behind these incredible bikes lives here in Tasmania, added bonus. Don’t forget to include the new Santos Travelmaster 3+ ! REI bikes are now Co-op Cycles, they dropped the Novara name. Looking at a “National ” touring bike from Mountain equipment Co op.has pretty good components. Any opinions on this bike ? What happened to the Waterford? KOGA !!!! Not Koga-Miyata, that’s history. Thanks for the article, Darren, but you made no mention of Specialized Awol or Awol Comp for bike touring? In your opinion, would you recommend this particular bike for touring? Thanks! so now a days people buy 4000 dollars bicyles to cycle 40000km .